News from LMCU: It’s a great time to sell and a great time to buy! It’s a great time to sell and a great time to buy! West Michigan’s housing market made a strong recovery last year, but leaders of the Grand Rapids Association of Realtors (GRAR) say there is still room to grow. Their biggest challenge is finding enough inventory for buyers who are eager to buy or relocate, said GRAR President Terry Westbrook. “There are buyers out there that are looking and can’t find what they want at every price range. There’s a variety of people out there looking for property across the price spectrum,” said Westbrook. So, is it really time to sell? 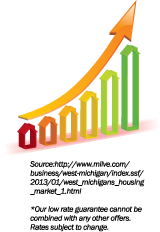 LMCU’s guaranteed low mortgage rates* help eager buyers secure financing. And of course, your next home will likely need a mortgage, too. With rates still near historic lows, this is a rare condition indeed.